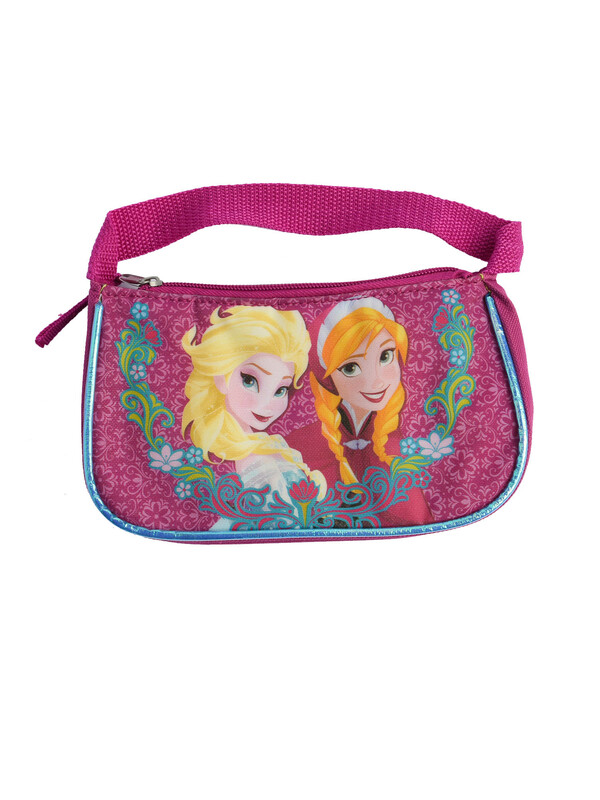 Complete your ensemble with this adorable Pink Frozen purse featuring your favorite characters, Elsa and Anna Girls Disney Frozen Elsa and Anna Bag Purse Small Pink Features graphic of Disney Princess Elsa and Anna printed on front panel with blue metallic piping. Other side is solid pink/purple color with no image. One main lined zippered compartment. Made of durable canvas construction. Purse measures approximately: 4.5"H x 8" W x 2" D. Strap Drop: 3", Strap Length: 11". Officially Licensed Disney merchandise. Recommended for ages 3 and up. • Girls Disney Frozen Elsa and Anna Bag Purse Small Pink Features graphic of Disney Princess Elsa and Anna printed on front panel with blue metallic piping. Other side is solid pink/purple color with no image. One main lined zippered compartment. Made of durable canvas construction. Purse measures approximately: 4.5"H x 8" W x 2" D. Strap Drop: 3", Strap Length: 11". Officially Licensed Disney merchandise. Recommended for ages 3 and up.